Speaking of hubbies and loved ones, I thought it would be fun to get a head start on Valentine's Day with some beautiful sewing themed papers. I do love a pun! For more details, please pop over to my post at Scrapbooker's Paradise. Thanks so much for visiting! I will be catching up with everyone as soon as I get caught up on sleep and get my energy back. Playschool is almost out for the holidays, so I pray we will have a couple of bug-free weeks. 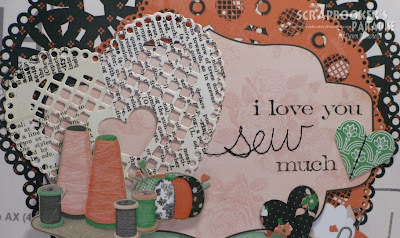 This card is adorable - and I love the sewing puns! Great idea to actually sew the word "sew." This card is adorable! Hope you feel better soon.